I hope you are enjoying Christmas wherever you are! We are having lots of fun and family time here in Norway, today we even had some snow! Finally! Here is a Christmas card using the cute Wee Stamp image. The papers are by Studio Light and Papirdesign. Enjoy the rest of your the holidays! 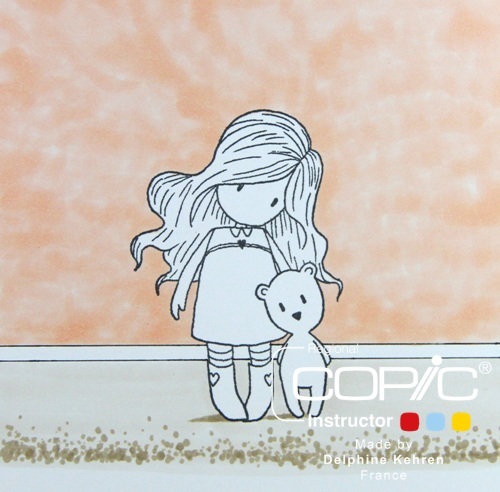 This was my final post for Copic Marker Europe. 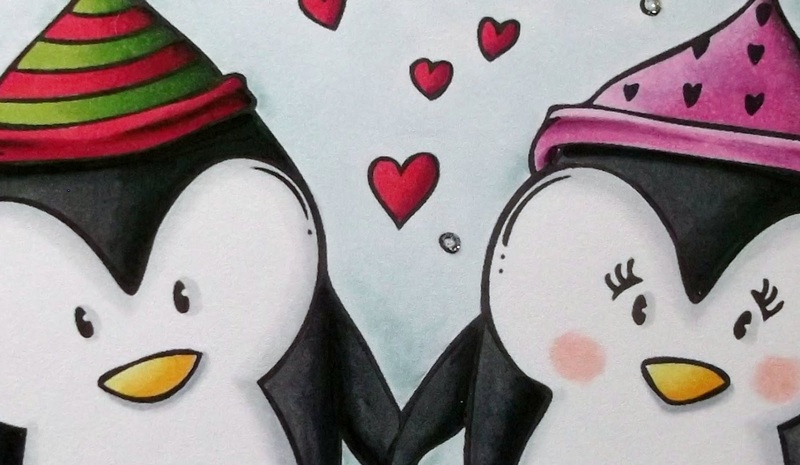 I really enjoyed sharing my love of coloring with all of you! Thanks for having me, I'll see you around! Hello everyone! 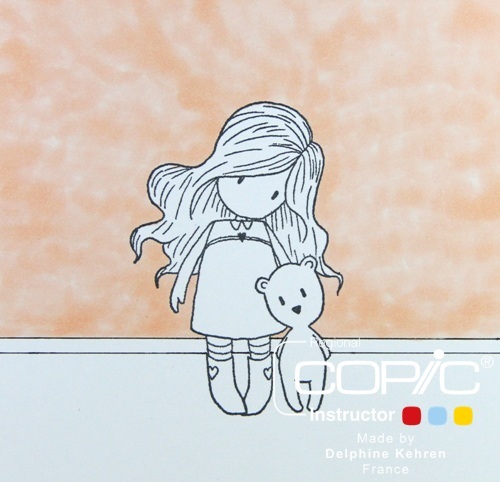 It's Delphine here today to share a little tutorial on an easy, simple background. I love images with white space around them, but I also like how different you can make your image look by filling that space and adding a coloured background. 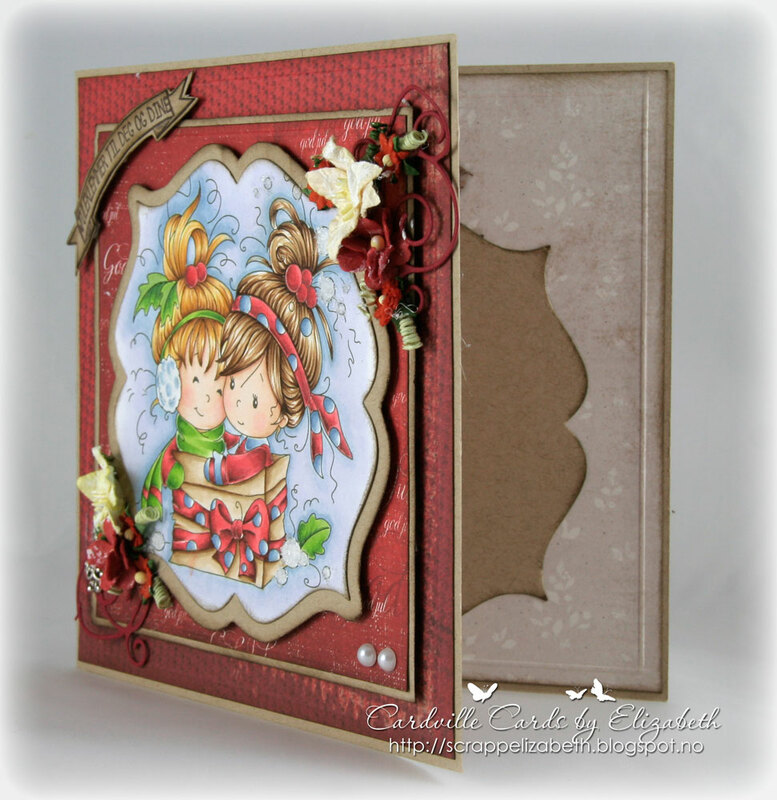 Even with no background stamps near at hand, you can create simple ones. Today we are simply going to place our character in a room and imagine a wall behind her and carpeting on the floor. The stamp I'm using for this tutorial is an "old" Gorjuss Girl stamp called Bear Hugs by Sugar Nellie. 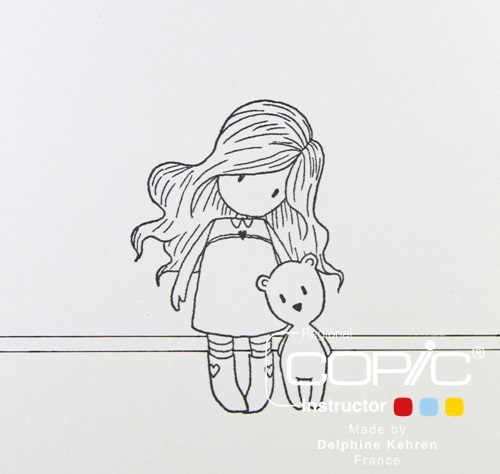 Stamp your character and with ruler and a Copic Multiliner (mine is black 0.05), draw two lines representing a skirting board. 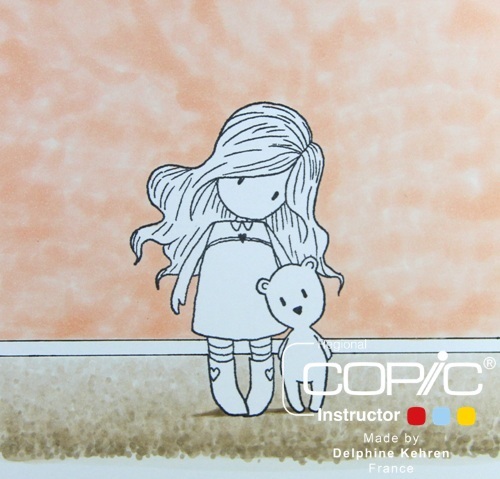 Choose a Copic for your background - mine is YR61 - and colour doing small circular movements. The aim is not to have a totally smooth wall, but rather mimic variations in the paint. For the carpeting, select 3 or 4 markers in the same shade. I'm going to use E40, 41, 42, 43. First colour the whole floor surface with your lightest marker (E40), then make little dots in the foreground with your darkest colour (E43). Take your next colour, one shade lighter (E42), go over the E43 dots you have just done and widen the dotted area going towards the background. Do the same with your E41, going over the E42 area and widening that dotted area even more. Take your lightest colour E40 and keep doing dots until you reach the skirting board. Colour the board (E44 here) and your character (details of colours below). Well, this was Rudolph out for a training run before his epic trip around the world pulling Santa's sleigh with his reindeer friends! He's now having a well earned rest! It is not overly clear in the photograph but I actually printed the reindeer twice so that I could fussy cut one and place it on top of the other with foam pads to give the image a little more depth, oh and I did the same with the frame! I hope you are all having a wonderful Christmas!! Hi you all! It's Christina again, my turn to show up here in the Blog! Remember I made a card for an 8 year old girl, earlier this fall. 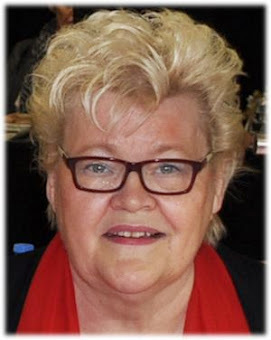 Her name was Fredrika. Well this card is for her little sister who turned 4 at the same time. 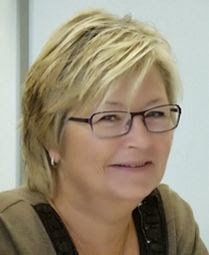 The image is from hÄnglar & stÄnglar - a former Swedish Company. 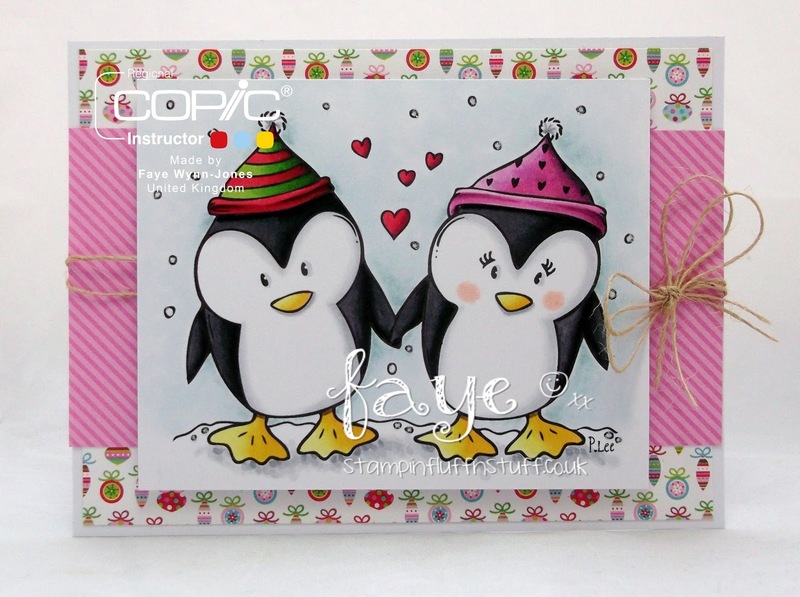 All the design papers are from Maja Design. Have a nice Boxing day! Hello everyone! 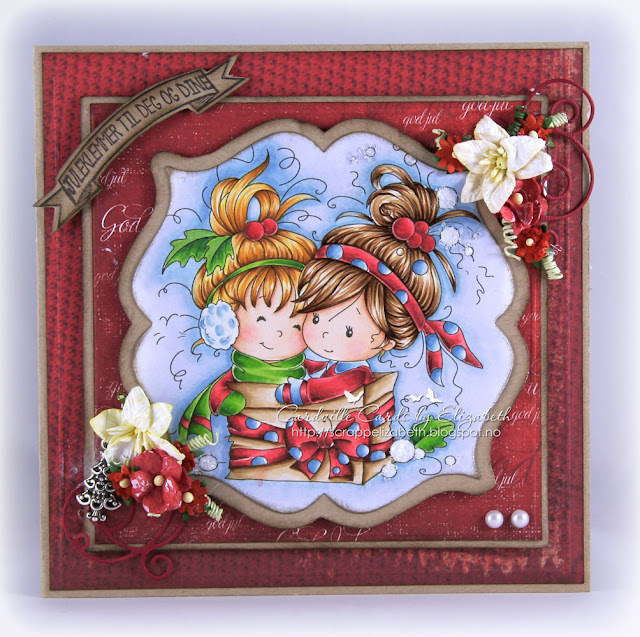 It's Delphine here today to share a Christmas scene (of course!! ), but one with DPs today - I do love using DPs from time to time too and you can still make scenes with them ;)! 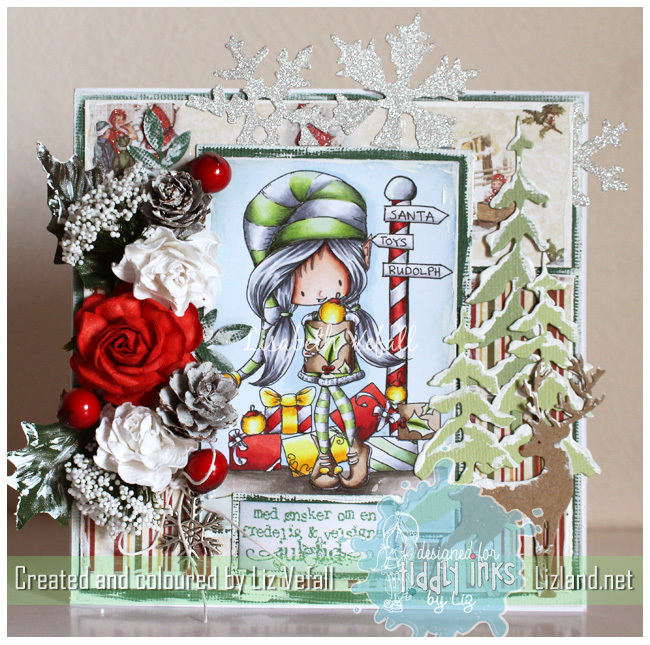 I used the adorable Lucy With Scarf and Roberto's Rascals Winter Cottage both by CC Designs. I coloured them with my Copics, cut them out and picked DPs by Bo Bunny. 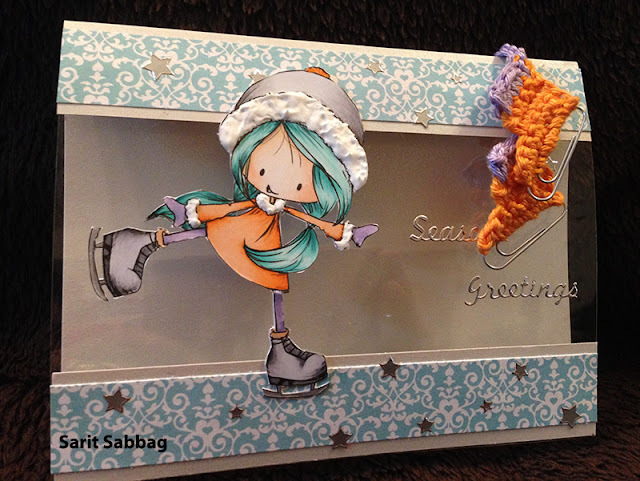 I put my images on foam squares for a bit of dimension, then added a few Snowy Days Enamel Dots by CC Designs. 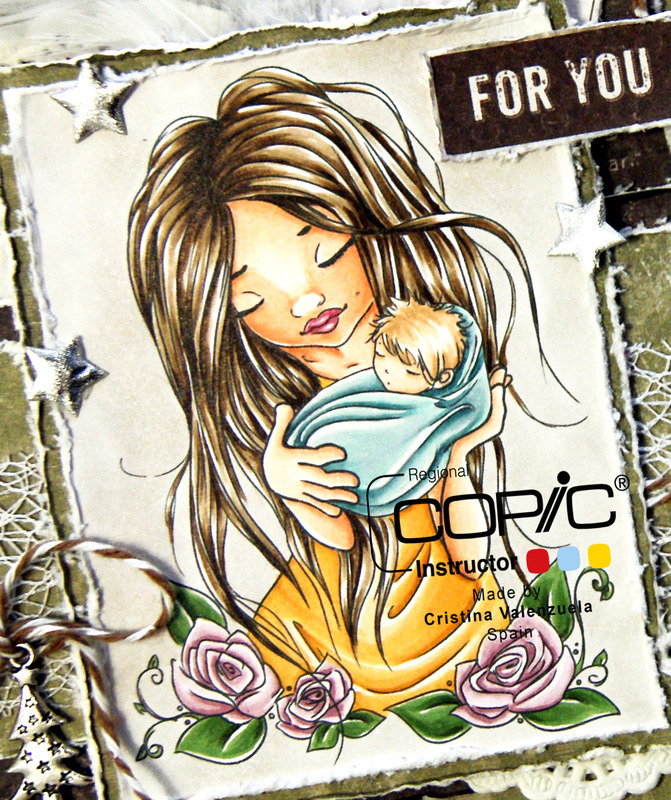 The sentiment is by Paperbabe Stamps, from the Sparkle Bright Sentiment Set. 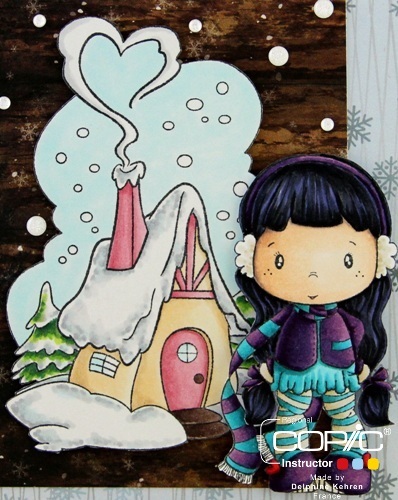 I'm Cristina Valenzuela and this is my card this month for Copic Europe. 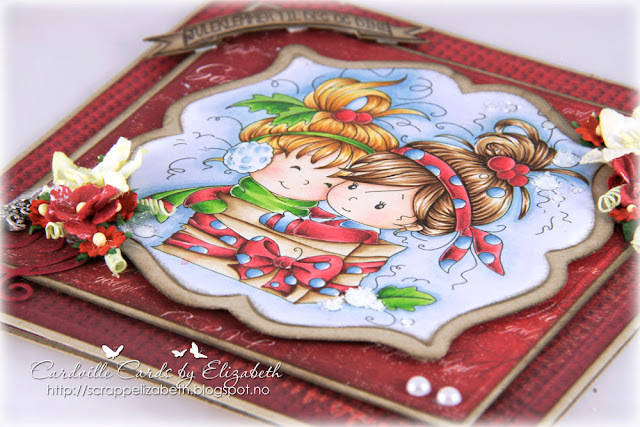 My last card this year is a Christmas card. I wish you a happy holidays with peace and love. Skin: E13, E11, E21, E00, E02. Hair: E42, E43, E44, E47. Dress: Y13, Y21, Y16, Y18. Next year we continue to see us here with a lot more inspiration and beautiful things to share. Thank you very much for keep visiting this blog! Brrrrrrrr……. Its cold outside…….. My Christmas cards are almost done. Today, I'm sharing a card I made for a friend. On this card I used the Skater Wryn Digi Stamp from Tiddly Inks. I know it's not the usual Christmas colours, I want it to be a bit different. 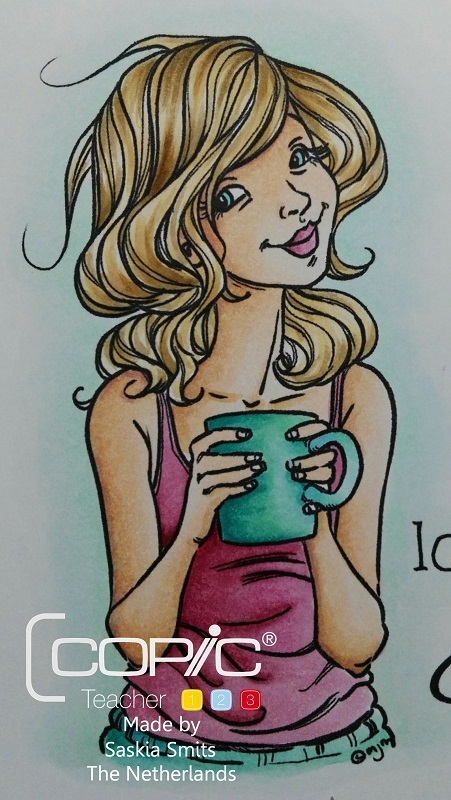 I chose the BG family for the hair, I wanted it to be light and breezy and used light colours. On the face I used my usual face colours, but this time I didn’t take the dark colours so "far" just a tiny bit to emphasize the shadow. 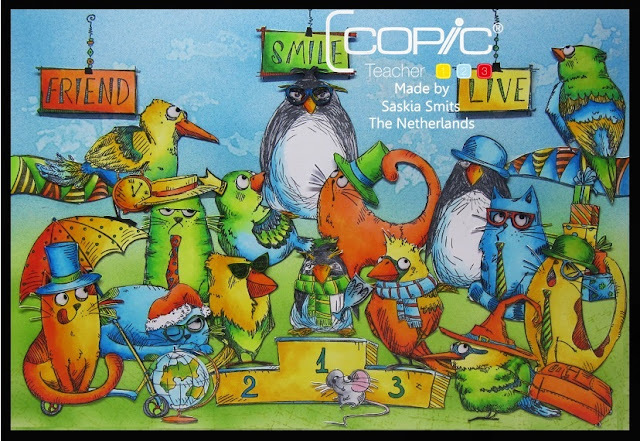 Franz from Italy here to share my latest make with a super lovely Saturated Canary image, coloured 100% with Copics of course! I found this girl too sweet and as soon as I saw her I thought of RED, the most Christmas colour of all! ...so RED is her skirt and about all of my card too! RED is one of the hardest colours to manage I think, but it can give you lot of satisfaction! After some attempts, I think I have found the markers combo that works better for me and now I'd love to colour every image in red! Maybe also because Christmas is just around the corner?!! Ok, crack open the Mulled Wine! 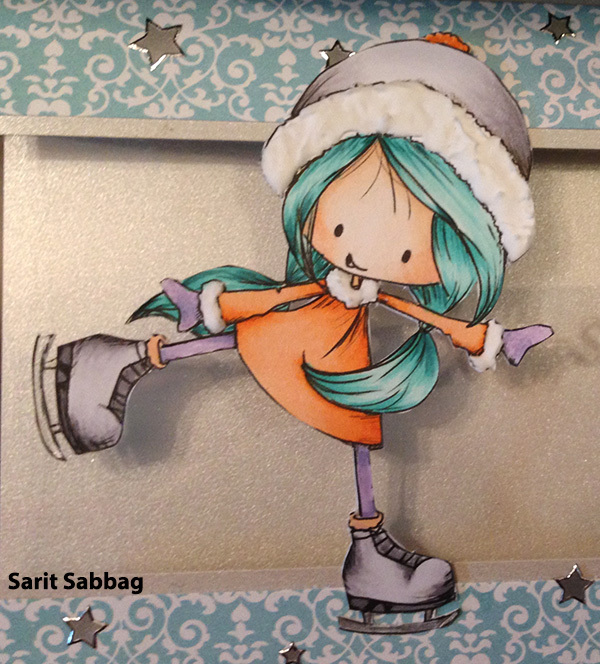 I took a break from Christmas cardmaking to make this card. I wanted to make a special card for a dear sister. When I saw this image, I knew immediately that this was the right one for her. We are both Vanilla Latte Macchiato lovers. And I love my sweet sister Wendy above anyone else. This image says everything I want to say to her....love you more than coffee. This image is by Mo's Manning and is called Coffee. It's me again, Deborah, with the announcement of the winner of challenge 45. 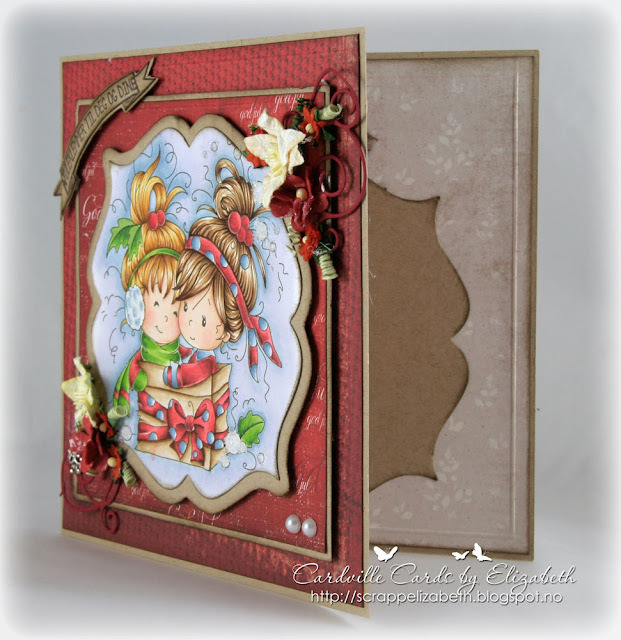 Check out this gorgeous Christmas card! On the 7th I had an art journal page with a skin tutorial for you. Today I have an art journal page to share, using the same techniques as on the 7th. Again I used an image by the East Wind. First some layers with E00 and E01. Instead of using BV00 for the shading I used a blue hue, the B41. Keep adding layers until you're happy with the result and then blend all layers together with the E0000. For the lips I used R20 and E04. For the hair I used the B12, 14, 18 and 41. I started with B18 and work my way back to the lightest blue, B12. Then go back to the darkest colour, add another layer to get more depth. For the dress I used YR61, 65 and 68. The flowers and ribbons are coloured with Y19, 23,15 and YG03,05,17 and 67. I used the YR61, 65 and 68 for some of the flowers too. 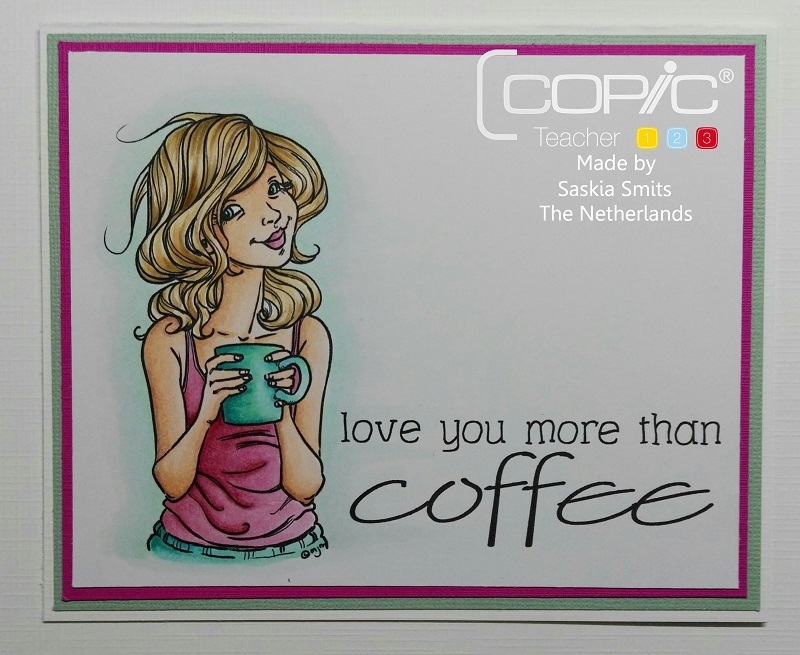 The quote was found on the internet and handwritten with Molotov Markers and Multiliners by Copic. 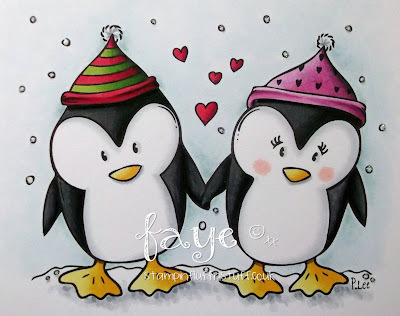 Have a fab Xmas and a very happy and creative 2016. Deborah here for you with the super fun NEW challenge #46! Thank you for all who participated to our latest challenge, it will be a hard time to choose a winner! There are so many great entries! The winner will be announced on sunday December 16. So no excuse for not entering the challenge, right? Here's my inspirational card for you. 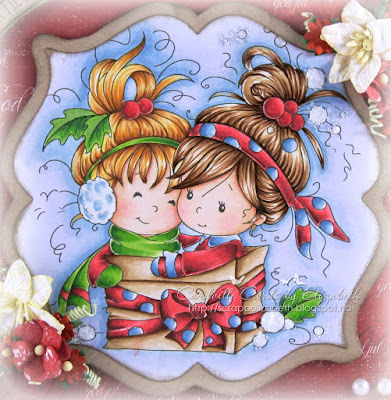 I've used "Holly Wreath Fairy", a digital stamp by Crafts and Me. The design of my card is pretty simple. I've heat embossed the die cutted sentiment in silver and added some sequins on my card for the extra bling bling. I didn't wanted to have a traditional Christmascard, so I've used a lot of pink in my creation. 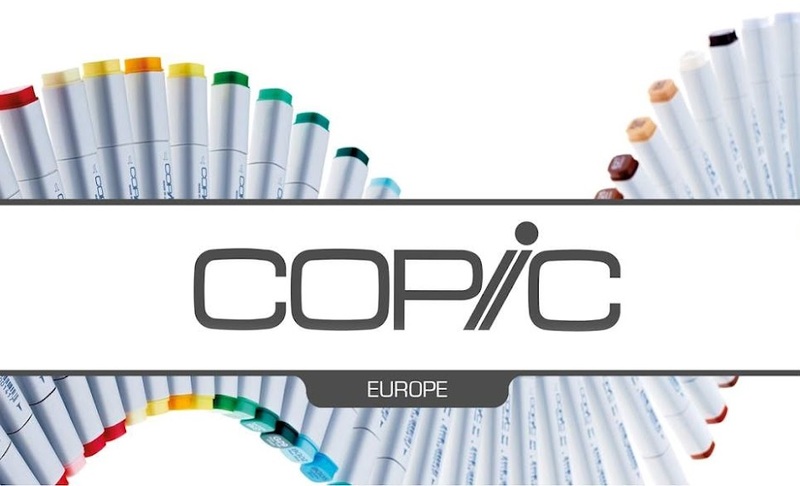 We made a Facebook group Copic Marker Europe and from now on, the challenges will be played over there. So be sure to add yourself to the group! before the end of January 10 2016. The winner will be announced on the 12th of January. We made a Facebook group!!! Whoohooo! Be sure to add yourself to the group and from now on, the challenges will be played over there! Feel free to show us your work! 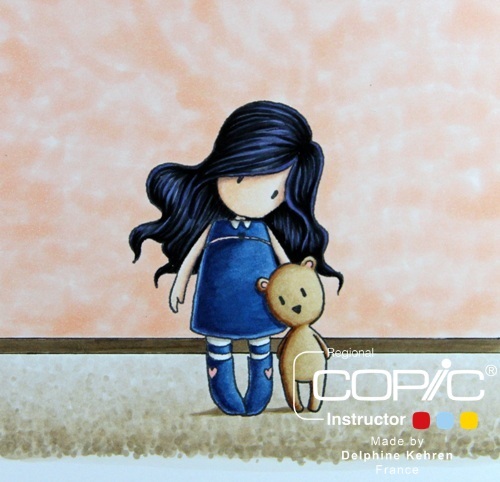 This is my first Copic Tutorial for the Copic Marker Europe Blog. I decided to teach you how to make clouds with the Activator Spray. Start with making a background with your Airbrush. 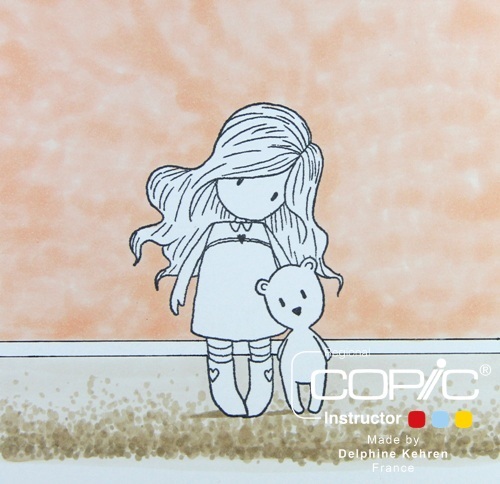 For the next step you will need a rubber stamp (I'm using a cloud-stamp by Katzelkraft), an acrylic stampingblock, a bottle of Copic Activator and a tissue. Spray the Activator on the rubber Cloud stamp. Remove the excess of the Activator Spray from your acrylic stamping block with a tissue. Tip: Do this immediately after spraying because Activator Spray evaporates very quickly. Stamp the clouds on your background. Press it gently and let the stamp rest for a few seconds so the Activator Spray can react with Copic Ink. When you remove the stamp, you will see that the ink has been diluted by Activator Spray. It looks a bit smudgy now, but the print will get more crisp if you give the spray a litte time to dry. I've used different cloud stamps to create a beautiful cloud cover. I've used a limited range of Copic colours. So you can see that you can create maximum impact with just a few colours. 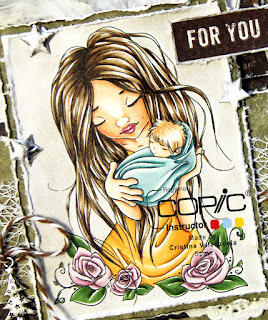 All the stamps I have used, are by Kaztelkraft.